English Abbreviations that you can’t avoid in daily Spoken English. Abbreviations are quite common in written English. But there are abbreviations that we use daily in our spoken English as well. 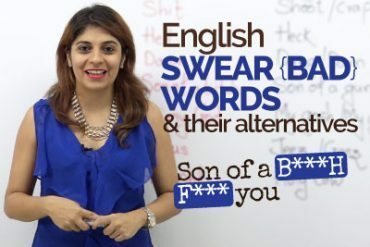 In today’s English speaking lesson with Sonia you will learn about some abbreviations that you can’y avoid while speaking English. These abbreviations are a part of our daily English communication and if you understand them well, it would help you in understanding fluent English speakers better. These abbreviations are commonly used by native English speakers and are well accepted in the English language. 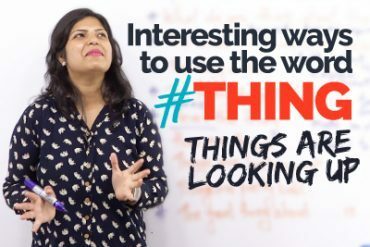 You are watching this English Lesson on Let’s Talk – A library of more than 1300+ free English speaking videos to speak English fluently and confidently. We have English training videos for Learning Grammar, English conversation in the real world, IELTS speaking test, Tips to improve English communication sills, Improving Pronunciation to speak clear English, American and British English lessons and Accent Training that would help you take your English to the next level. So my nephew came home the other day alright? And as soon as he walked in he says, “Sonia, please give the Wi-Fi password ‘ASAP’” and I was like, okay you can take it. You can have the password and he is only eight alright? But he uses abbreviations so easily and so often. Yet I’ve noticed that some of us have a tough time using abbreviations just because we are not sure of the meanings, okay? So when in doubt who would you come to? You need to come to me, Sonia, yes because I’ll be taking you through ten unavoidable abbreviations today which are very commonly used but sometimes we still get stuck because we don’t know the exact meanings, alright? So let’s get started and see exactly what we have in store. The very first one here it says ‘PIN’ alright? So firstly what’s an abbreviation? That’s something that you need to know before I forget, an abbreviation is basically nothing but a ‘short form’ okay just remember that. So abbreviations are short forms. Like I said the first one we have here is ‘PIN’. The full form of ‘PIN’ is ‘personal identification number’ alright? So obviously because it’s such a, you know, it’s such a long word we say ‘PIN’ ‘personal identification number’. Now one thing you need to remember here is this abbreviation already has the word ‘number’ in it but many of us incorrectly say what’s your PIN number alright? But that’s incorrect because it already has ‘number’ in it so you simply say what’s the pin on your phone or can you help me with my ATM PIN alright? we use ‘PIN’ for our ATM cards, we use it as passwords on our phones, etc. Just remember you don’t need to say ‘pin number’. Just ‘PIN’ is enough. The next one here ‘ASAP’ like my nephew used it ‘ASAP’ means ‘as soon as possible’ alright? So let me write that ‘as soon as possible’. This is a very common abbreviation or a common short form that’s used a lot in emails, it’s used in text messages, it’s also used when you speak to people. Like for example in an email you could say, “please reply ‘ASAP’” okay or we need to go shopping ASAP some people even say it as ASAP that’s also fine. Now the next one here this is also confused a little bit, it says ‘RSVP’ does it ring a bell? Yes you read this particular short form a lot on invitations. If someone invites you to a wedding or a party or anything like that, you may notice this abbreviation written below it says ‘RSVP’ which means ‘please reply’. Now you must be wondering you know this doesn’t add up as such because RSVP it’s a French, it comes from a French phrase alright? In English we would say ‘RSVP’ which means ‘please reply’. Now notice one more thing here this particular phrase already means ‘please reply’, however quite often we make the mistake of saying ‘please RSVP to John’ or ‘please RSVP by the 10th of October’, which again is incorrect. You can simply say something like ‘‘RSVP’ by 10th of October’ okay? Which means ‘please reply by the 10th of October’, let us know if you’re going to attend the function or not. Remember you don’t need to use please with the abbreviation ‘RSVP’ and then we have ‘RIP’. Now if you notice on Facebook nowadays mostly people update almost everything on Facebook so if someone has unfortunately passed away, you may notice that people comment and say something like ‘RIP’ John or ‘RIP’ Jack okay so ‘RIP’ means ‘rest in peace’ okay? It’s used to, you know it’s a comment that you make when someone has passed away and you wish for their soul to rest in peace, okay? You would also see it on tombstones sometimes. If there’s someone who’s buried and at their grave, you would see ‘RIP’ written at the tombstone, which means ‘rest in peace’. The next one here and this is quite popular ‘ATM’ yes ‘ATM’ the full form for it is ‘automated teller machine’. Now I’m sure we all know what an ATM is, it’s basically a machine where you put in your debit card, alright you enter in your ‘PIN’ and you’re able to withdraw money. There are also many more bank related transactions that you can make because the ‘ATM’ is related to your or connected to your bank. The full form of ‘ATM’ is an ‘automated teller machine’. In a sentence you could say, ‘could you tell me where is the closest ‘ATM’, please?” As simple that. The next one here and this is quite interesting I must say okay? It says ‘BYOB’. Can you even guess what this could mean? Well BYOB means ‘bring your own booze’. Yes! Okay, ‘bring your own booze’. Now booze basically means drinks anything which is alcoholic. So say if you’ve been invited to a party, okay and at certain parties’ people may not really serve alcohol but they’re perfectly alright with their guests getting their own alcohol or their own booze to the party. So maybe if you received an invite by email possibly somewhere towards the end you would see a phrase like, oh sorry a short form like ‘BYOB’ which means bring your own booze or bring your own alcohol, your own drinks alright? Now the next one here it says ‘BBQ’. Now this one has two meanings, okay? The first and the most common one for ‘BBQ’ is, ‘barbecue’. Okay for all the food lovers, barbecue is basically roasted meat. It’s when you roast any kind of meat and you have a barbecue, alright? So it’s basically roasting meat. You could even have a barbecue party, okay? So that’s one full form of the abbreviation ‘BBQ’. Another one that’s quite the slang you could say is, ‘better be quick’. How innovative is that, let me write it here, ‘better be quick’. Now see this one it’s obviously very informal, it’s very, it’s a slang, alright? So you could use it in your text messages, if someone uses WhatsApp, you could use ‘BBQ’ to mean ‘better be quick’. But it’s not very common in spoken English as such when you’re speaking to someone, ‘BBQ’ is something that you would relate to ‘barbeque’ instantly or even if you see this written on you know in a sauce, like it’s a barbecue sauce you may see something like ‘BBQ’. However remember you can even use it as ‘better be quick’. And then we have ‘e.g.’ so what does that mean? It means ‘for example’, okay? Now this is normally used only in the ‘written form’, like when I’m speaking I can’t say I need to buy some shirts, ‘e.g.’ formal shirts, informal shirts. I can’t say that it is just incorrect. However in the written form you can use this to say ‘for example’. So if you are reading a sentence you would see something like, ‘there are many reptiles which lay eggs, ‘e.g.’ snakes, frogs, etc. You would read a sentence like this. So when you want to give an example in the ‘written form’, you use ‘e.g.’. There’s another one here and this one gets misunderstood quite often, ‘i.e.’ which is read as, ‘that is’. Okay that’s how you read it but what it means is ‘to clarify’ okay? So again this is an abbreviation you will use in the ‘written form’ not in the ‘spoken form’. When you see this written somewhere you’ll simply say ‘that is’. So for example you would say, ‘I need or I bought some coffee, ‘i.e.’ which is very hot’, okay? So ‘to clarify’ something you would see this in the written form but when you pronounce it when you say it you need to say ‘that is’, alright, I hope that’s clear. And finally we have this very common one okay which is unavoidable, we see it everywhere, ‘etc.’ means ‘et-cetera’, alright? So say if you’re listing a couple of things, if you say that I went shopping today and I bought some shirts, trousers, skirts, etc. okay? It means ‘so forth’. It’s basically used when you listing something and ideally there would be many items because of which you are using ‘etc.’ e-t-c. So yes these are the ten unavoidable abbreviations which you should know, they should be extremely clear and you should not make any mistake when using these because they are really simple, alright? So you make sure that you start practicing ‘ASAP’ and I’ll make sure I come back soon with something much more interesting, till then you take good care of yourself, good bye. Next Next post: 5 Job Interview Questions & Answers that fail you.